Why has the Brussels-based commission been so long exploring the interest in trilateral talks with Ukraine and Russia ahead of energy supplies in winter 2016/2017? The beginning of autumn is the best time in Europe because there is insignificant rainfall and the ground still has stored warmth through the summer. But as the old saying goes, in fair weather prepare for foul. In recent years, one of the necessary preventive measures to prepare for the winter heating season was the trilateral format of gas talks involving the European Commission, Ukraine and Russia to sign a "winter package" securing gas supplies for Europe and Ukraine during the winter season. For the first time a ‘winter package’ was agreed on 30 October 2014 after seven rounds of the trilateral talks in Brussels. One year later last autumn the three negotiating parties reached agreement on the next winter package much earlier on 26 September 2015. This year, there was a considerable delay in the official notification by the European Commission of its intention to restart the format of trilateral gas talks with Ukraine and Russia. On September 1, Maroš Šefčovič, European Commission Vice-President for Energy Union wrote on Facebook: "In the past, this forum has proven its usefulness: it is better for all to sit down together around one table. Russia as an exporter, Ukraine as a transit country and the EU as the main importer share a common interest ..." But this is nothing more than just a signal to begin the process of preparing possible negotiations, and with a few days remaining before the date of signing of "winter package" in the past year. What are the reasons for the delay in the initiative of the European Commission to restart the gas talks and what could be the consequences for Europe? As it was before, each of the three negotiating sides evidently has its own distinct motivation behind the "common interest' mentioned above. With regard to the European Commission, the current ability of Europe to prepare for the coming winter should be of alarming concern. 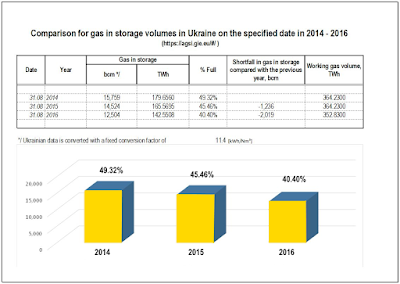 Any person who is familiar with the peculiarities of gas imports by transit via Ukraine knows that in this case the security of supplies is technically dependent on active volumes of natural gas in Ukraine’s underground gas storages (UGS). It is precisely these UGS facilities, which were mostly built in the previous century in Western Ukraine together with other parts of gas transport infrastructure, should ensure stability of supplies for European consumers to reduce vulnerability to cold weather shocks. According to Eurostat, 15.0 % of the natural gas entering the EU come from Ukraine’s transit in 2015. Evidently, not only a winter package, but the full active volume of gas in the UGS will give a guarantee to bring reliably to the EU countries the necessary volumes of gas through the Ukraine's transit during the coming winter. 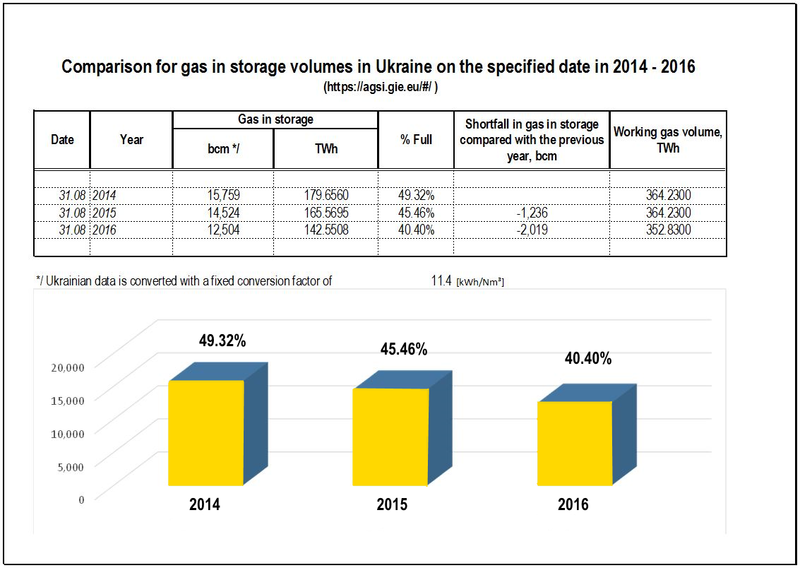 However, as data of Aggregate Gas Storage Inventory (AGSI+) transparency platform of Gas Storage Europe (GIE) reflects the fact that Ukraine is significantly overdue in injection of natural gas into UGS. Experts note with concern that such a fundamental characteristic of any UGS facility as "Gas in storage" showing the gas contained within it at a particular time is much lower this year. As table above indicates, GIE reported that on August 31, 2016 there was only 12.5 bcm gas in UGS, 40.4 % of the total working gas volume. At this point, there is a substantial slippage in the schedule seasonal injection of natural gas - the volume of gas in storage accumulated on August 31, 2016 is 2 bcm less than at the same date during the previous year. It seemed that usual volumes of gas seasonally pumped into Ukraine's UGS, which once met the winter peak demand are now unavailable and this situation has so far not received the attention it requires neither in Brussels nor in Kiev. It would not be overstating the case to wonder whether energy policy makers in Brussels use any seasonal checklist in addition to the gas stress tests well-publicized in the EU. Such a checklist is supposed to be kept under constant review along with the weather forecasts for the coming winter. Another question remains: would it be acceptable to ignore the importance of this challenge hoping that rather warm winter would repeat again and again? The probable reason for a clearly insufficient attention to the Ukraine's UGS before the coming winter might have to do with the weakening the EU interest among both beneficiaries and providers of financial support to the Ukraine's gas transit and its national economy as a whole. Thus, we can see that, while urging Russia to continue gas transit through Ukraine in words due to European `solidarity’ with that country, in deed the EU reveals less enthusiasm about ensuring the reliability of gas supply route via Ukraine. This should not be surprising to those who have followed the situation. The existing practice of EU relations with Ukraine shows that at a time of deep economic and financial crisis, and other huge challenges in that country implementation of any measures to be initiated by Brussels to keep Ukraine's gas transit afloat would need to be financed with the direct participation of the EU. Possible results of future trilateral gas talks would differ significantly from the previous winter gas package because of a substantially changed situation. Let us recall that according to the "winter package" of 2014 the Russian side provided a discount in the amount of 100 USD per thousand cubic meters. In 2015 the winter package envisaged that Kiev would pay a reduced price of 232 USD per thousand cubic meters during the period covered by the agreement (October 2015 – March 2016). Earlier, Ukraine was paying 252 USD per thousand cubic meters. The EU also agreed to allocate 500 million USD to Ukraine’s Naftogaz to ensure gas stores of 2 bcm for the 2015-2016 winter season. However, currently it is unrealistic to await that outcomes of future talks would be somewhat similar to the previous ones, since all the circumstances, including also Russia's position, have changed significantly. Obviously, price reductions will not be on the agenda of the next trilateral talks. At the end of June one of online news portals in Ukraine (http://ukropnews24.com/) cited the statement of Russia's Energy Minister Alexander Novak that "it will be absolutely competitive prices, at a level not above the market ..., no discounts on gas for Ukraine is necessary". Furthermore, Ukraine’s Energy Minister Igor Nasalik also recognized that Russian gas is considerably cheaper so-called reverse, which Ukraine prefer to buy in Europe. "Yes, we pay more because we pay for transit through Ukraine, and across Europe and back, and today the price is 185 USD. Direct contract with Russian the price would be 140 USD," said Igor Nasalik on August 24, 2016, speaking in Ukrainian TV channel, according to The Newspapers. Many of you could pay attention to how Minister Nasalik described the overpayment of 45 USD as the price of "Ukraine’s independence from Russian gas". Given the large volumes of gas purchases, the cost of "independence" of Ukraine turns into a very large, economically groundless expenses – the country has to pay extra 45 million USD for every bcm of natural gas. However, as can be seen Ukraine does not bother that reverse gas for UGS and internal market is much more expensive. Meanwhile it seems not to be recognized by Ukraine as its own problem. It is clear that due to the limitations of its own funds for gas purchases the Ukraine's side has taken a wait-and-see attitude towards the trilateral talk’s prospects expecting answer to the main question: who will give money to obtain necessary volume of gas before winter? And who could doubt that the EU will be the first to pay the Ukraine’s gas bill again. The official reason to allocate funds has become the regulatory reform of the energy sector in Ukraine. "Completing this process will allow the European Commission to provide 600 million Euros of macro-financial assistance," - said Maroš Šefčovič. There might be a feeling that if Ukraine received enough reverse gas and funding to pay for it, then the critical issue of UGS readiness for the coming heating season would be solved without the participation of Russia. That is exactly what is being pursued as a primary goal of an unceasing struggle for the Ukrainian energy independence and the present course of European policy to ensure the security of supply. However, it would just be a rather common delusion. We have to admit that Russia's participation is necessary due to the external circumstances: first, we should not forget that reverse gas is sourced from the EU gas imports from Russia. And second, within the remaining time before the start of the heating season it is already impossible to ensure the readiness of Ukraine's UGS only by means of reverse gas. There is a common opinion shared by all parties of the trilateral talks that to ensure a secured gas imports to the EU through Ukraine's transit in winter the company UkrTransGaz, which operates underground gas storage facilities, should accumulate 17 bcm of gas by the start of a new heating season. To achieve this, it is necessary to pump into the underground storages in Ukraine still about 4.5 bcm of gas. What should cause far more concern to gas consumers in Europe would be the lack of time to complete technically this gas injection task because it is known that the reverse gas flow capacity from the EU to Ukraine amounts only to 40 mcm per day. That is why if only reverse gas were used, that would take practically four months to perform the injection operations. In this case, the required volume of gas in Ukraine's UGS would be filled out almost in Christmas Eve! But that is not all: we should also bear in mind the gas needs in Ukraine that are also met by the reverse from the EU, which has become the only external source of natural gas supplying the Ukraine’s domestic market since Kiev stopped purchasing Russian gas directly. Thus, in the coming months many of us being European gas consumers will be able to take more or less part in assessing the real capabilities of UGS facilities and Ukraine’s gas transit as a whole. In the meantime, the question remains present in the mind of Europeans as to why there is no any other gas imports route including among other pipelines from the North of Russia through Belorussia or the Baltic, which has caused over the years as much trouble as Ukraine's gas transit does? Why do gas consumers in the EU in addition to their genuine concerns regarding workplace and home place temperature have to worry about what a balance pointer reads when Ukraine's UGS problems and growing Kiev debts on one side await to be counterbalanced on the other side by Brussels politically motivated desire to preserve Ukraine's gas transit by all means? And how will the upcoming winter weigh all pros and contras?